The other day, while I was waiting for Marshall to get back from a late night, I decided to get in my crafting mood. I have spare canvases sitting around since they were on sale, got a box of new Crayola crayons at the store, and went to work. 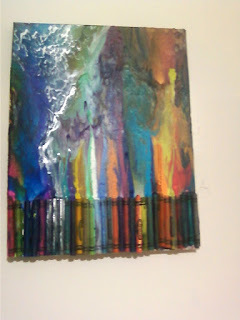 Here is how I made my beautiful canvas crayon art! Hot glue the crayons in any order/pattern you want to the canvas. Be sure it is secure. Plug in the hair dryer and point it at the ends of the crayons by the edge of the canvas. You will slowly see the wax melting! I was probably doing this for about an hour until you see the finished product above. But that is it, that's all you have to do! You can of course strategically move the hairdryer at different angles to get colors to mesh into eachother, or to cover the crayons themselves with wax, etc. It is all up to you and your hairdryer. An viola! A beautiful, quick and easy creation. I have been wanting to do this for years! Next time I will try to make it into a certain shape or pattern...it seemed pretty tricky for the first time around.